Herb was in a car accident during college. A few years later he was rear-ended. Twenty years later he fell off a 32-foot ladder. Since that time not one day has passed without pain. Myrna has lived with pain for 35 years, the results of various accidents, illnesses, and migraine headaches. She depends on her strong faith and supportive friends to get through each day. Leilani developed psoriatic arthritis twenty years ago and lives with chronic permanent pain. She still works a full-time job. Chris’ back degenerated with age and damaged discs caused severe pain and foot dragging. Severe pain kept him in bed for months, and at times he was suicidal. Two surgeries have transformed his life and he is now nearly pain free. These true stories are from friends of mine. Some are young. Others are old. All have lived with pain. Most still do. All were gracious to share openly with me so I could tell you their experiences. I have not used their real names. Me? I am a novice and five years of living with pain isn’t much. Compared to what many suffer my pain might be termed more bothersome than crippling. My pain—extremely severe aching—stems from a degenerating spine. I had surgery (laminectomy with instrumented fusion) in October of 2014. It was a success in opening up three critically narrowed vertebrae, but the pain continues and new MRIs reveal multiple problems that age likely will worsen. Injections into my vertebrae have—for now—taken care of the right-leg weakness that brought a cane into my life. I am most grateful. I can manage my pain with medication and stretching—so far. I want to explore this difficult subject because it’s likely my pain will get worse as my back ages and I want to be ready. I want to encourage everyone I can by every means I can and maybe reading this will help someone. And writing it may help me. Years ago I read an arresting article by Phillip Yancey, one of my favorite authors, entitled, “The Gift Nobody Wants.” Mr. Yancey collaborated with the brilliant Dr. Paul Brand, a gifted surgeon who committed his life to those with Hansen ’s disease, formerly known as leprosy. This disease with a gruesome calling card of disfiguration has been a dreaded worldwide scourge until the 1940s when a drug was discovered that kills the disease-causing bacteria. Lepra, a UK based organization (https://www.lepra.org.uk) claims that Hansen ’s disease is now is completely curable. Why am I bringing up Hansen’s Disease? Because the disfigurement and sometimes loss of hands, eyes, and feet is caused by no pain. The infecting bacteria produce an anesthetization that keeps the infected person from noticing a sliced foot, a burned hand, or an infected eye. Left untreated, these painless wounds allow infection to rage and gangrene to set in, often resulting in amputation. So we can see the reasoning behind Philip Yancey’s assertion that pain is a gift. Pain is the body’s alarm system that something is wrong. Pain alerts us to a bee sting, a cut finger, a dislocated vertebra, or an infected appendix. Without pain we would not know we need treatment. Usually, the worse the injury or disease, the worse the pain. We are blessed to live in a day and age when sophisticated diagnosis, treatment, and medications are available. But even with modern medicine, pain persists. What happens when it becomes a fact of life for you? How we deal with pain is highly personal. We have learned that a positive attitude is invaluable and a strong will to survive carries some people for a long time. Norman Cousins was given a few months to live in 1964. He had Ankylosing Spondylitis, a rare disease of the connective tissues. He was told that he had a 1 in 500 chance of survival. He responded by choosing to live around those who believed he could survive and did not have “the culture of defeat.” Most notably, he watched comedies for hours and claimed that laughter alleviated much of his pain. He died in 1990, twenty-six years after the diagnosis. It’s normal to respond to long-term pain with anger and frustration. Sandra wrote that, “The longer this journey continued, the more frustrated and angry I became with God. Why hasn’t he healed me? I had family and friends who were praying. I had been anointed and prayed for by my pastor. My dad was anointed for me at his church. Why wasn’t he helping the doctors figure out what was going on? I just wanted to get my life back.” Chris was frustrated by the burden that his pain created for his wife, although she never complained. 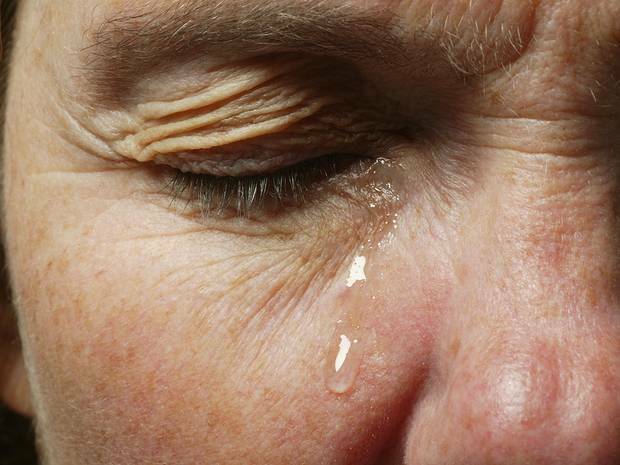 Feeling trapped by pain also leads to depression or worse. Some people suffer silently. Others reach out for help. Being proactive is important. Sandra stressed the importance of doing what the doctors said, taking her medicine, and following through on physical therapy. Sometimes the therapy and exercise worsened the pain, but she did what she could. Become an expert on your condition. Knowing what to expect keeps you from being blindsided. Chris found meaning and a purpose to go on by volunteering at a church. I asked my doctor for antidepressant medication (after a four-year hiatus) and my emotional improvement helped me start blogging, which gives me purpose. Stay in touch with friends. Social networking on sites such as Facebook can keep your friends and family connected. If we will allow our pain to drive us to discover more about God and magnify our compassion and empathy for those who suffer, does it not make us better? 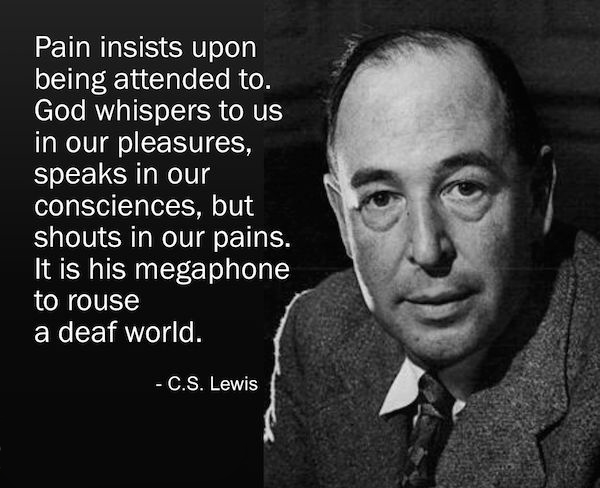 If pain is, as C. S. Lewis asserted, God’s megaphone, could it not become an invaluable catalyst to clean our spiritual house and allow God to make us like Him? And perhaps only the desperate truly look for God wholeheartedly, which is the entrance to His presence and eternal companionship. Living with pain DOES show what we’re made of. Monica has suffered from chronic pain and a number of inflammatory ailments for over 25 years now. Probably since childhood, actually. She spends the majority of time in bed at this point with heating pads and pain medication to make things as bearable as possible. Not once have I ever heard her ask, “why me?” She may think it, but she doesn’t get into the whole self-pity thing. I’m actually more inclined to do that because it affects everything in life and as her spouse, I usually feel pretty helpless to do anything about it. Considering I have health issues of my own, including chronic depressive tendencies, that only makes it more difficult…for everyone. I guess what I wanted to say is that sometimes the person in pain can be stronger than those trying to learn to live with another ‘s disabilities. I have to hand it to her, I don’t know that I would fare as well as she does if the roles were reversed. When pain affects one in a family, it affects all. And it can show what each of you is made of in how one copes with it. I only wish I were better at it.